While studying the common fruit fly, UCLA stem cell researchers found that blood stem cells are receiving systemic signals from insulin and nutritional factors, which helped them from differentiating into blood cells. UCLA stem cell researchers have shown that insulin and nutrition prevent blood stem cells from differentiating into mature blood cells in Drosophila, the common fruit fly, a finding that has implications for studying inflammatory response and blood development in response to dietary changes in humans. Keeping blood stem cells, or progenitor cells, from differentiating into blood cells is important as blood stem cells are needed to create the blood supply for the adult fruit fly. 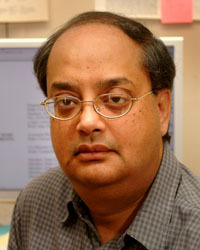 The study found that the blood stem cells are receiving systemic signals from insulin and nutritional factors, in this case essential amino acids, that helped them to maintain their “stemness,” said study senior author Utpal Banerjee, the Irving and Jean Stone Professor and chairman of molecular, cell and developmental biology in the UCLA Division of Life Sciences and a researcher with the Eli and Edythe Broad Center of Regenerative Medicine at UCLA. The study appeared March 11 in the peer-reviewed journal Nature Cell Biology. In the flies, the insulin signaling came from the brain, which is an organ similar to the human pancreas, which produces insulin. That insulin was taken up by the blood stem cells, as were amino acids found in the fly blood, said Ji Won Shim, a postdoctoral fellow in Banerjee’s lab and first author of the study. Shim studied the flies while in the larval stage of development. To see what would happen to the blood stem cells, Shim placed the larvae into a jar with no food — they usually eat yeast or cornmeal — and left them for 24 hours. Afterward, she checked for the presence of blood stem cells using specific chemical markers that made them visible under a confocal microscope. In the fruit fly, the only mature blood cells present are myeloid cells, Shim said. Diabetic patients have many activated myeloid cells that could be causing disease symptoms. It may be that abnormal activation of myeloid cells and abnormal metabolism play a major role in diabetes. Going forward, Banerjee and his team are seeking other system signaling molecules that may be controlling blood stem cells in the fruit fly. The two-year study was supported by the National Institutes of Health and a training grant from the Broad Stem Cell Research Center at UCLA. 1 Comment on "Preventing Blood Stem Cell Differentiation by Nutrition and Insulin"
This mecanizm may explain the positive helth effect of starvation in humans. May be this is one of the causes for rejuvanation in starvavion therapy.